Exposure to mold can cause cold-like symptoms, respiratory problems, nasal and sinus congestion, watery eyes, sore throat, coughing and skin irritations, and can easily be breathed deeply into the lungs, it is not safe to live in houses wit high mold. This publication tells the health effects, where to look for mold, mold removal and preventing mold growth. Exposure to mold can cause cold-like symptoms, respiratory problems, nasal and sinus congestion, watery eyes, sore throat, coughing and skin irritations, and can trigger asthma attacks. Because some mold spores are very small and can easily be breathed deeply into the lungs, it is not safe to live in houses with high mold levels. Exposure to high mold spore levels can cause development of an allergy to mold. People can react to mold whether it is living or dead. Everyone should minimize their exposure to mold. Children, the elderly, pregnant women and people with existing respiratory sensitivities are at higher risk for adverse health effects from mold. Some people are affected when exposed to very little mold, while others may show no adverse health symptoms when exposed to mold. If you can smell a musty odor or see mold, you have a mold problem. Reliable sampling for mold can be expensive since it requires special equipment and training. Testing is not generally recommended as a first step. Mold grows on organic materials, such as paper, dirt, wood and soap scum. Mold grows on moist materials, so mold growth is likely in areas wet by water leaks, flooding, humidity levels above about 70 percent and condensation. Any flooded area that was not completely dried within about one day is likely to have mold growth. Walls need to be opened and rapidly dried to prevent mold growth. Any area that is stained from water should be examined for mold growth. Peeling paint may be an indication of wet walls. Moisture seeping through concrete walls and floors will cause moist conditions likely to cause mold growth on or in walls, carpeting and materials stored in the basement. Mold often grows under cabinets, behind baseboards, inside walls, in carpet padding and under vinyl wall coverings. An unvented clothes dryer creates a very humid, warm environment conducive to mold growth. Closets may have mold growth if clothing is damp or if there is a cool outside wall in the closet. Also, there is a chance mold might be growing behind furniture, particularly against an outside wall. Mold will not normally be found in furnace or air-conditioning ducts unless they were flooded because the heated or airconditioned air is very dry. Moisture coming through a basement floor or wall may deposit a light-colored salt and other minerals that are sometimes thought to be mold. The deposits should quickly dissolve and disappear when wet with water if they are a salt. 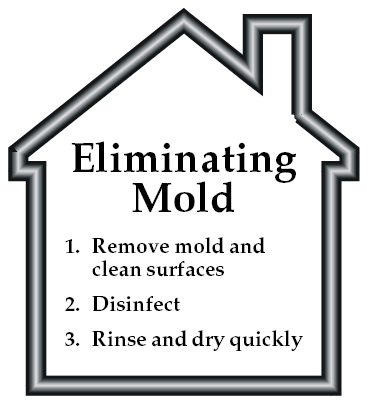 Since people react to mold whether it is living or dead, the mold must be removed. Take steps to protect your health during mold removal. Use a mask or respirator that will filter out mold spores. Usually it will be designated as an N95, 3M #1860 or TC-21C particulate respirator. Wear eye protection, rubber gloves and clothing that can be immediately laundered. Dampen moldy materials before removal to minimize the number of airborne mold spores. It is impossible to completely remove mold from porous surfaces such as paper, Sheetrock (drywall) and carpet padding, so these materials should be removed and discarded. Scrubbing may not completely remove mold growth on structural wood, such as wall studs, so it may need to be removed by sanding. Wear personal protective gear and isolate the work area from the rest of the home. After the mold is removed, disinfect the area using a bleach and water solution or another disinfectant. The amount of bleach recommended per gallon of water varies considerably. A clean surface requires less bleach than a dirty surface. A solution of ¼ cup to ½ cup bleach to 1 gallon of water should be adequate for clean surfaces. The surface must remain wet for about 15 minutes to allow the solution to disinfect. Concentrations as high as 1½ cups of bleach per gallon of water are recommended for wood and concrete surfaces that could not be thoroughly cleaned. Provide adequate ventilation during disinfecting and wear rubber gloves. Finally, rinse the entire area with clean water, and then rapidly dry the surfaces. Use fans and dehumidifiers or natural ventilation that exchanges inside air with outside air. The moisture problem must be fixed to prevent future mold growth. Since there are some mold spores everywhere and since mold grows on any wet organic surface, the only way to prevent mold growth is to keep things dry. Air cleaners will not solve a mold problem. A high-efficiency air filter that removes mold spores may reduce the number of spores in the air, but mold spores rapidly settle onto surfaces, such as the floor, where air filters cannot remove them. Filters may reduce the number of mold spores in the air but are not substitutes for removing the mold. Air cleaners that produce ozone are not effective at eliminating mold. Ozone is a lung irritant that should not be in an occupied space. This material is based upon work supported by the Cooperative State Research, Education and Extension Service, U.S. Dept. of Agriculture, under Project Award No. 00-4120-0936. Any opinions, findings, conclusions or recommendations expressed in this publication are those of the author(s) and do not necessarily reflect the view of the U.S. Dept. of Agriculture.